Both Ricochet and Cori are part of our 501(c)3 non-profit organization, Puppy Prodigies located in San Diego county. Upon inception, we raised and trained service dogs for individuals with disabilities. We have been offering canine-assisted programs since 2006. Our grassroots organization prides itself on our pioneering efforts and innovative programs utilizing highly skilled and task trained service dogs, certified and registered therapy dogs and trained emotional support dogs. We offer highly effective, non-traditional approaches to enhance and improve quality of life for individuals with physical, cognitive, or emotional Disabilities. ​The mission of Puppy Prodigies is to provide unique initiatives that utilize service, therapy and emotional support dogs in an effort to empower people with disabilities, kids with special needs, wounded warriors and veterans with PTSD. 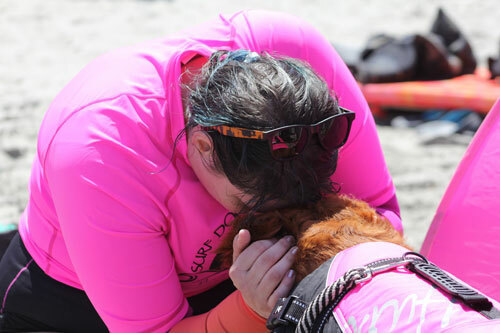 We build the foundation for future teamwork by positively strengthening the human-animal bond which allows for profound paws-on healing interventions. Our values are deeply rooted in the quest to facilitate lifelong bonds between people and dogs. Our Executive Director, Judy Fridono has an Associates Degree in Assistance Dog Training from Bergin University of Canine Studies​​​​. Judy also has a bachelor's degree and her previous corporate life included a career in healthcare administration/business development. She also received certificates from San Francisco's Hearing Dog Program and the Marin Humane Society's Canine Behavior Academy. She held a certified professional dog trainer title, and knows the value of education.